The APW Quarterly Newsletter is a 10+ page, advertising-supported publication featuring commentary from the association president, current events, legislative and regulatory updates, and association news. It is published in February, May, August, and November. To view a copy of this press release in its entirety, please click here. Madison — Wisconsin's roads likely will face longer delays before they get repaired. Gov. Scott Walker told reporters Thursday he would not support hiking taxes or fees to pay for highways unless corresponding cuts are made elsewhere in the state budget. He also said he didn't want to rely too much on borrowing for roads — an idea that his fellow Republicans who control the Legislature already are reluctant to do. If he sticks by those stances, ongoing projects would likely take longer to complete and planned ones would take longer to get started because collections of gas taxes and registration fees have been stagnant in recent years. Road Builders: 9-Percent of Wisconsin Bridges "Structurally Deficient"
The head of a state road-building organization says a new report highlights the need to change how the Wisconsin funds highway and bridge repairs. The study by a national transportation group found about nine-percent of the bridges in Wisconsin rate as structurally deficient...which means one or more sections are in poor or worse condition. Wisconsin Transportation Development Association president Jerry Derr says the bridges are still safe to drive over. He says many of the bridges are behind schedule for maintenance. Others are handling more daily traffic than they were designed for. Derr says the D-O-T does a good job at inspecting and prioritizing repairs...but the budget can’t keep up. He says the state needs to increase the pace of repairing or replacing bridges, which means finding new funding sources. "A band-aid approach to repairs, and putting it on the credit card no longer works," he said. Derr says solutions could include increasing gas taxes or vehicle registration fees. Governor Scott Walker said he'd consider those changes, but only if the increases were set off by cuts somewhere else in the state budget. State lawmakers sparred with the governor in the last budget cycle over bond borrowing for road projects. Officials say roads ranked 4th worst in nation due to funding. Chances are the streets you drive on every day could be some of the worst in the nation. Madison's Streets Department does patching and other minor repairs to help, but city engineer Rob Phillips said those Band-Aids aren't enough. "We've got some projects that really need to be done,” Phillips said. "Our biggest project is on the Capital Square. Over the next two years we are doing the Capital Square,” Phillips said. "There are some very significant building projects that need to be constructed here in the city and our roads will have to wait,” Phillips said. "According to their criteria, 71 percent of our roads are either in poor or mediocre condition," said Craig Thompson, the executive director of the Wisconsin Transportation and Development Association said. "There were only three states that were worse than us." 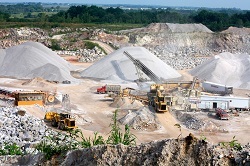 APW's board has been alerted to an ordinance created by the town of Deerfield that would significantly impact local aggregate producers' operations. These types of ordinances have been ever-increasing throughout the state and addressing this issue has become the biggest legislative priority for APW. As a result, the APW board has decided to host a legislative day later this year in an attempt to educate legislators as to the effects these types of ordinances have on operations. It is imperative that there is a good turn-out for this event, and the board encourages all members to participate. To view a copy of the town of Deerfield's latest ordinance, please click here. Stay tuned for future news relating to the upcoming legislative day.